I am probably a bit late to the party, but TED-Ed is one of my new favorite online learning platforms. TED’s “Lessons Worth Sharing” are certainly that and more. TED-Ed lessons are built around TED-Ed Original, TED Talk or YouTube videos, with subjects ranging from the arts and mathematics to business, health, teaching and education, and my favorite thinking and learning. From “The Ethical Dilemma of Self-driving Cars” to “Why Do Some People Go Bald,” there is no lack of content worth checking out on TED-Ed. There are also series, collections of videos on a particular topic, like “Superhero Science,” “You Are What You Eat,” or my favorite “Everyone Has a Story.” And last but not least, TED-Ed Clubs. TED-Ed Clubs supports students in presenting their big ideas in the form of short TED-style talks. Some students may even end up on the TED stage and online. Want to learn how to start a TED-Ed Club (why not, right?)? 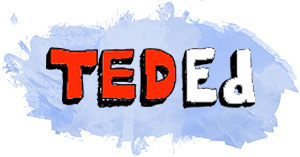 Download the TED-Ed Club information packet. I highly recommend checking out TED-Ed in its entirety. A solid resource for students, parents, educators, and life-long learners of all ages.